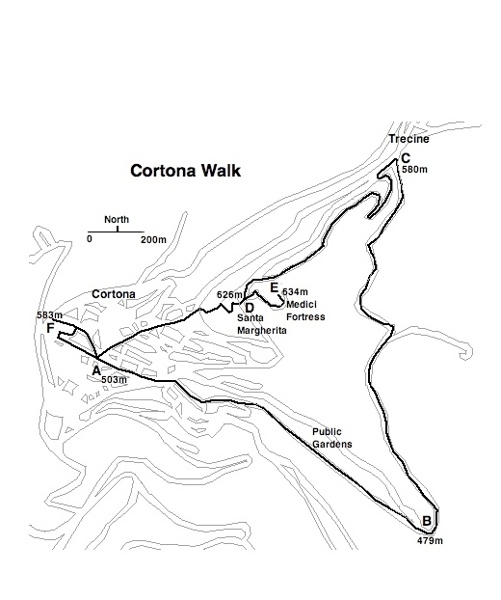 Here are the directions for the Cortona town walk taken from my e-book, Circular Walks On The Tuscany Umbria Border by Martin Daykin. You can also get this walk on your Kindle for free by clicking on “try a sample”. Alternatively, you can buy the whole book and get instructions for 20 great walks including a Perugia City Walk. Walking Time 1:20. Allow up to 2 hours (more with museum visits). Fairly easy, but a steep descent along medieval streets and quite a few steps. 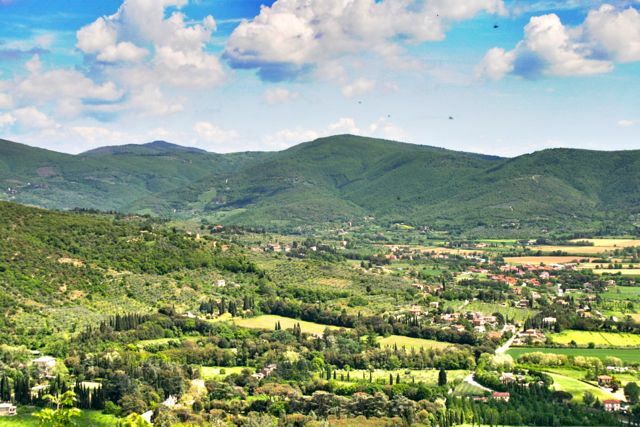 Cortona is an ancient town dating back to Etruscan times. Look in the lower parts of the town walls and you can still see the huge blocks of stone that the Etruscan wall was built from. Apart from the property and tourism boom that the town is currently undergoing, its heyday was in the medieval period from around 1100 to 1400. 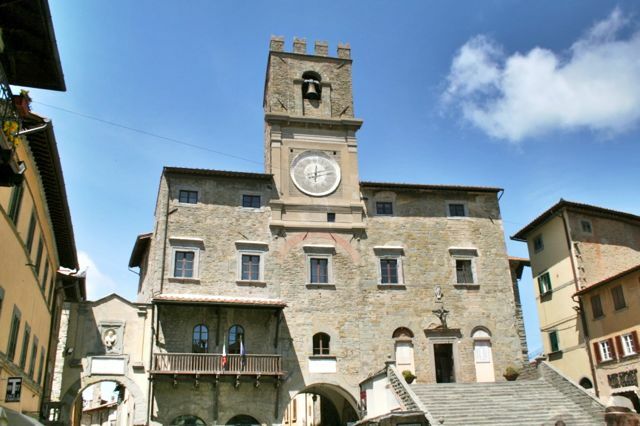 During this era, Cortona was an independent city-state and its grandest buildings date back to this time. 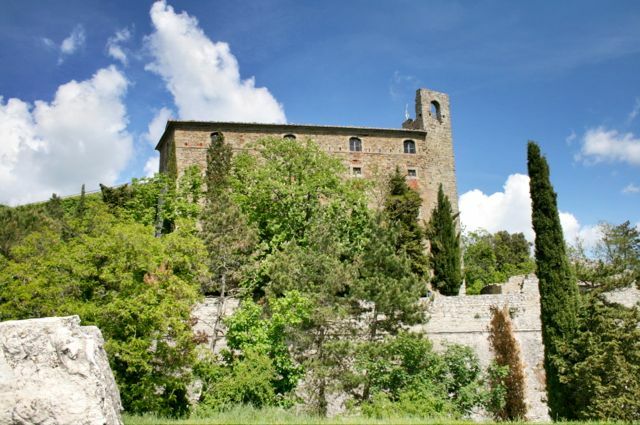 Later, it was a Florentine outpost on the border with the city-state of Perugia and then the Papal States. Due to its peripheral position, a combination of high taxation and under-investment left the centre in a medieval time warp. There are two fine Renaissance churches outside the walls but very little architecture from this period within the town. Park in one of the car parks outside the town walls, these can get very full during the tourist season, so it’s best to arrive early. The walk begins in the Piazza della Repubblica in the centre of Cortona, head to the centre of Cortona and you can’t miss it. The most impressive building in this piazza (and the town) is the medieval town hall, the Palazzo Communale, which dates back to the 1200’s. A-B Leave the centre of Cortona and go through the park. B-C Gentle climb to Torreone, a hamlet at the top of Cortona. C-D Along a track to the church of Santa Margherita. D-E A detour from Santa Margherita up to the Medici Fortress. E-D Return to Santa Margherita. D-A Descent to Piazza Signorelli through steep medieval streets. A-F Short stroll for a view near the Duomo. F-A Walk through narrow medieval streets then back to the start. In the Piazza della Repubblica, stand with your back to the steps which lead up to the Palazzo Communale, and walk along Via Nazionale; this is the street at the right corner (east) of the Piazza. After 3 minutes, you should be at the end of the street, ignore Via Santa Margherita going up to the left. The flagstone paved street finishes and joins a tarmac road on a sharp bend. Continue straight on, ignoring the road descending to the right near a war memorial where buses turn around. A minute later, you pass the church of San Domenico on your left. There is a badly damaged fresco by Fra Angelico behind glass above the entrance door. Just after the church, turn left into the public gardens. You pass another war memorial and then a fountain on the right. A minute later, there is a play area on the left. Follow the tarmac road around to the left and then continue straight on, climbing steadily. The road is not busy but it is a sensible precaution to walk on the left so that you face any oncoming traffic. 3 minutes after joining the tarmac, the road is lined with cypress trees. 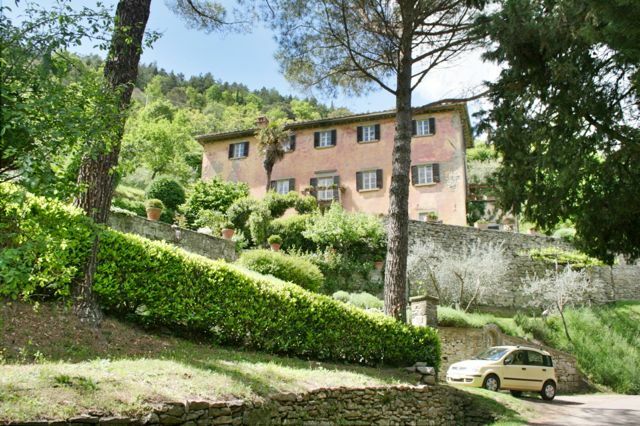 You pass several houses on the way up, after 15 minutes you pass Bramasole, the house that featured in Frances Mayes’ book “Under the Tuscan Sun”. It is covered in orange/yellow stucco and has a madonnina (statue of the Virgin Mary) set in the wall. Note: if you watched the film and this doesn’t look like Bramasole, the answer is that a different house was used for the film. Turn left here and after a minute turn left again onto the cypress-lined track, sign posted with red and white markers by the Club Alpini Italia (CAI). After 3 minutes, the track curves sharply right and a tarmac road heads off to the left. Cross the piazza, keeping the facade of the church on your left. Go through the gap in the balustrade at the far side and turn right down a cobbled path. 3 minutes later, the path emerges onto a street at the top of Cortona. Turn left onto the street and then right (straight on), there is a small church on your right. A minute later, you come to a square with ilex trees (it is actually shaped like a triangle), turn right and head down the steeply descending Via Berretini. A minute later, you pass the house of the painter and architect Pietro da Cortona (Pietro Berretini 1596-1669) on your right. Immediately after, you pass a large medieval water cistern on your left. Continue down for another 2 minutes and you pass the church of San Francesco on the left, the first Franciscan church to be built outside Assisi. You may feel that it’s time for refreshments at the outside tables of the piazza’s pricey bars, if not, continue with the walk. Pass to the right of the Palazzo Communale and a minute later you are in Piazza Signorelli. Here, you will find the entrance to the Etruscan Museum (Museo dell’ Accademia Etrusca Cortona or MAEC). The recently revamped museum houses the many Etruscan artifacts found in the area, a collection of paintings and Egyptian mummies amongst other curiosities, it is well worth a look around. You can sometimes arrange visits to the Etruscan tombs in the plain below Cortona, where many of the pieces on display were found. 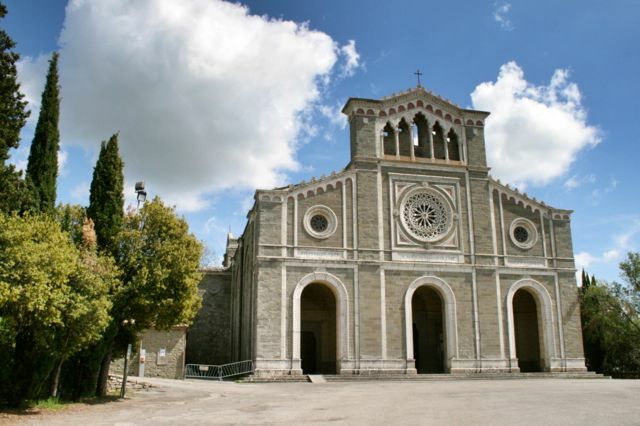 You can buy a joint ticket for MAEC and the Museo Diocesano (see below) which gives you a small discount. Turn around, on your left is the Duomo (Cathedral) and on your right, the Museo Diocesano, which displays art works from Cortona’s churches. (Shut Mondays and open 10.00-19.00 from April to October; 10.00-17.00 in other months). The Duomo is only for serious church enthusiasts, but the small Museo Diocesano contains a wonderful altarpiece depicting the annunciation by Fra’ Angelico. It also has several paintings by Luca Signorelli, the most famous painter from Cortona. Walk down Via Zefferini at the far right of Piazza del Duomo, take the first right onto Via Cioli and turn left onto a narrow street with overhanging houses, Via Ianelli. 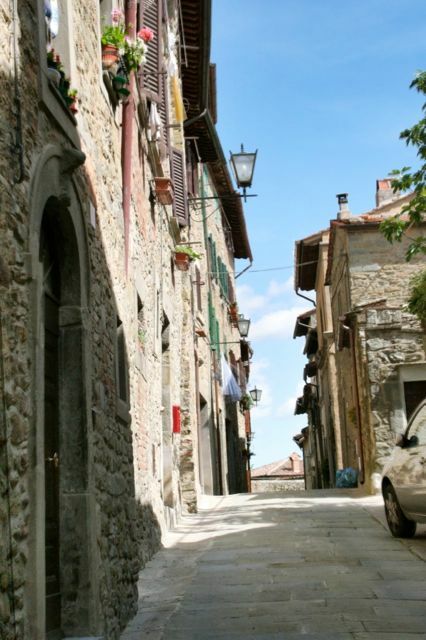 I have read that this is how much of Cortona once would have looked; the overhangs were removed from most houses to allow light into the narrow streets. It is now 3 minutes from the wall at the edge of Piazza del Duomo.